Every year, our organisation hosts ‘Bowling’, an annual fundraiser for local and international conservation organisations. To date, the ASZK and the zoo community have combined to raise $97,000 for valuable conservation work in the field! We would love you to organise an event in your area, no matter how big or small! If you are interested in organising an event or would simply like further information about how you can be involved, please don’t hesitate to contact our bowling coordinator at bowling@aszk.org.au. The TRCC is a non-for-profit organisation that rescues and rehabilitates, orphaned, injured or displaced tree kangaroos for release back into the wild or for life in captivity as breeding animals for education and conservation in Zoos. This vision of the organisation is to assist in the prevention of the extinction of Tree kangaroos. We’re delighted to be Bowling to raise funds for this organisation in 2019 and hope that you can join us! 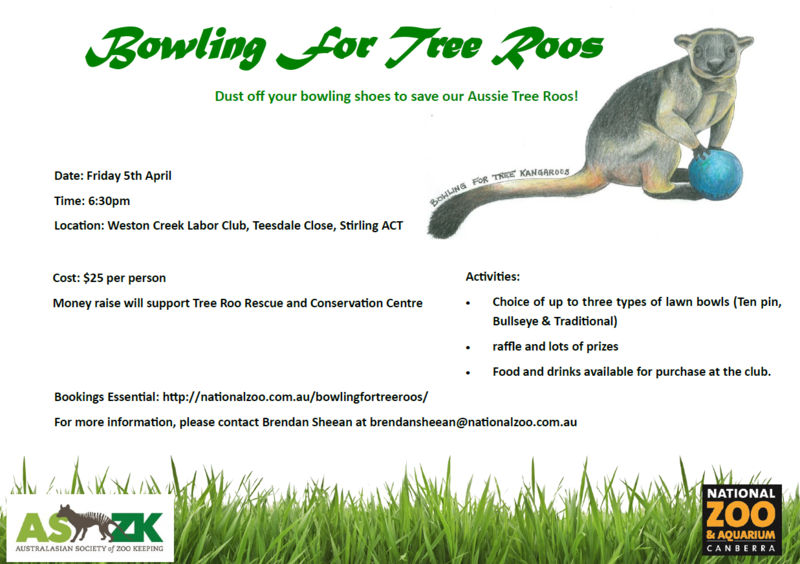 It’s time to dust off your bowling shoes and save our Aussie Tree Roos! During the week of 1st – 7th April 2019, the Australasian Society of Zoo Keeping (ASZK) will be running its annual fundraiser. This year Tree Roo Rescue and Conservation Centre Ltd, Australia has been selected due to the very important work they are undertaking with Lumholtz’s Tree-kangaroos. Previous events have seen us raise over AUS $97,000 which has been donated to projects dedicated to species in need. View some of our past campaigns below! Where/How Money was Spent Provide support for projects in Zambia, Zimbabwe and Namibia. Where/How Money was Spent DNA analysis of predator scats, saliva and hair remnants found on radio-collars and/or carcass remains. This event aims to bring the extended zoo community together to raise money for a species that really could use our help. Together with the wider community, zoos, wildlife parks, nature reserves and aquariums will come together from all over Australasia for a great night of fun and entertainment, all for a fantastic cause.